About a month ago Dr. Pierre Deviche led a dragonfly walk at Boyce Thompson Arboretum. Pierre has rapidly become a regional expert in dragonflies, and it was a great experience to attend. The highlight of the walk was a Kiowa Dancer damselfly, Argia immunda. The Kiowa Dancer is relatively rare in Arizona, and in fact is generally only found in Oklahoma, Texas, New Mexico, and Southeast Arizona. The damselfly was captured by net and held up (though not very still). Damselflies, like dragonflies, are members of the group Odonata. Damselflies are much more slender and often less conspicuous. Their eyes are more spherical, and their resting posture is significantly different than dragonflies. 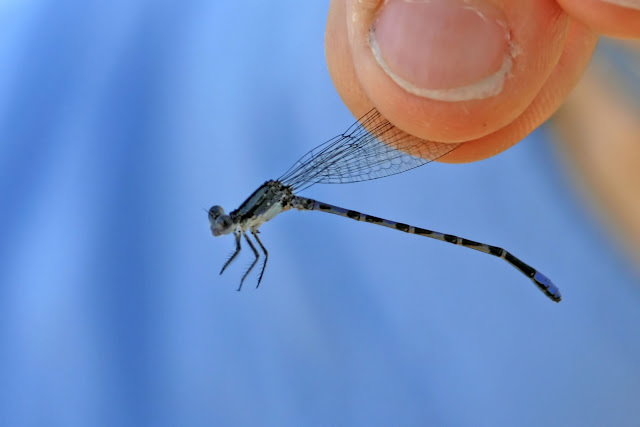 For those looking to learn more about the differences, I found this blog with an excellent post comparing damselflies to dragonflies. As for the Kiowa, the blue/violet tail tip is one of the initial diagnostics. And actually, more accurately that long thin tail is the abdomen, which is generally described as consisting of 10 segments. In this case, segments 8-10 are the blue/violet. Segment 7 generally is black in the Kiowa. The Kiowa dancer generally has a good amount of violet on its head and thorax as well. Females tend to be more highly variable in color according to bugguide.net and Dragonflies and Damselflies of the West.